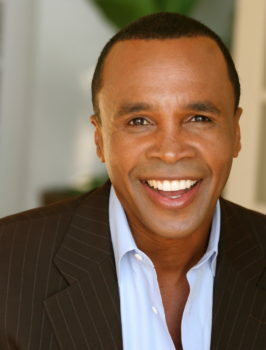 Los Angeles, CA – June 21, 2017: Habitat for Humanity of Greater Los Angeles (Habitat LA) will honor “Sugar” Ray Leonard at its 2017 Los Angeles Builders Ball® to be held Thursday, September 28th at the historic Beverly Hilton Hotel. Mr. Leonard is the first honoree to be announced and will receive the organization’s Dream Builder Award recognizing his commitment to helping those in need in the community, as an individual and through the vast efforts of the Sugar Ray Leonard Foundation. Each year, Habitat LA honors outstanding individuals and companies that are committed to revitalizing and transforming the landscape of Los Angeles. 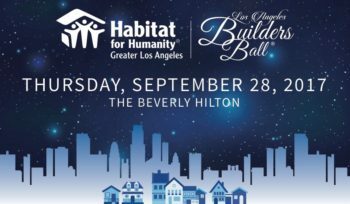 In addition to recognizing Habitat LA’s counterparts in the building and real estate industries, this event will also raise funds and awareness for the nonprofit’s Building a Greater Los Angeles campaign to help empower low-income families by building strength and stability through homeownership. The Builder of the Year award will be presented to a preeminent residential or commercial builder or developer in Los Angeles whose contributions demonstrate creativity and innovation. The Foundation Builder award will be presented to an outstanding organization or individual that has made a transformational impact through advocacy work, a significant contribution to neighborhood investment, leadership in spearheading intentional change in communities and/or a lasting legacy of economic growth. The Dream Builder award will be presented to outstanding individual(s) who have distinguished themselves through a commitment to community revitalization and investment. Past honorees include Earvin “Magic” Johnson, Bernards, Quincy Jones, Arnold Schwarzenegger, Maria Shriver, Mauricio Umansky, Delta Air Lines, Bank of America and Trammell Crow Company. More 2017 recipients will be announced soon. Sponsorship opportunities and tickets are available for this annual sell-out event at http://bit.ly/LosAngelesBuildersBall2017. For questions regarding sponsorship, please contact Helen Dosta, Director of Development at hdosta@habitatla.org or (424) 246-3653. Habitat LA has built, renovated or repaired nearly 800 homes locally, helping to transform the lives of more than 4,000 Angelenos. By 2020, Habitat LA has a goal to invest $100 million into revitalizing neighborhoods and increasing access to affordable homeownership and home repair opportunities. This investment will benefit the local economy by building strong and stable homes in partnership with families, individuals, volunteers, municipalities and donors, which will bring strength and stability to local communities throughout greater Los Angeles. Habitat for Humanity of Greater Los Angeles (Habitat LA) brings people together to build homes, communities and hope. As the top nonprofit homebuilder in the greater Los Angeles area with five consecutive Charity Navigator 4-Star ratings, Habitat LA has partnered with volunteers, donors and Habitat homeowners to build, renovate and repair more than 1,300 homes locally and worldwide since 1990. The lives of thousands of individuals have been transformed as a result of having a decent and affordable place to call home. Habitat homeowners help build their own homes and pay an affordable mortgage. By supporting Habitat LA through volunteerism, donations and supporting affordable housing, everyone can help families achieve the stability and self-reliance they need to build a better future. To learn more, visit www.habitatla.org.